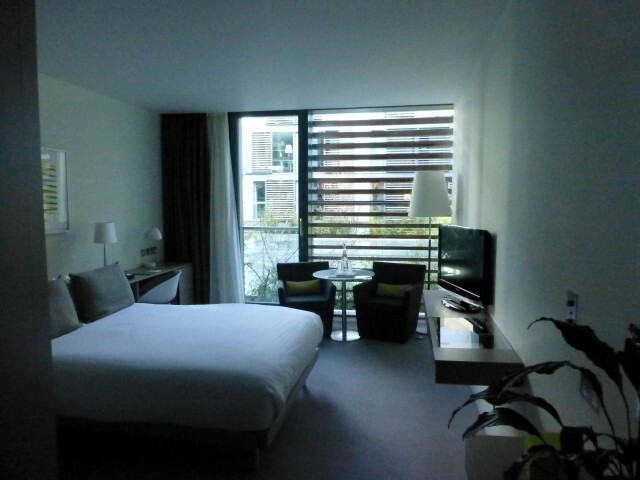 In Dublin we stayed at the Gibson Hotel (@thegibsonhotel) located in the Docklands area, just north of the River Liffey and next to the O2 Center. This is a very sleek and modern hotel. The hotel has parking, but if you drive I guarantee you will drive around the hotel at least once, missing the parking garage entrance — we did it twice. The hotel lobby is on the third floor and has such high ceilings and an open feel. We planned on parking the car just long enough to unload it, check in then return the car to the City rental shop. We approach the front desk and the only woman working really jumped into action. I loathe when you walk up to a check-in area and the customer service person just stands there like a bum. Not here. She told us about the hotel amenities, including complimentary wifi and that breakfast was included in our room rate (I must have found a coupon or a code of some sort while I was booking, because I would not have paid the 25 Euros per person for the breakfast). 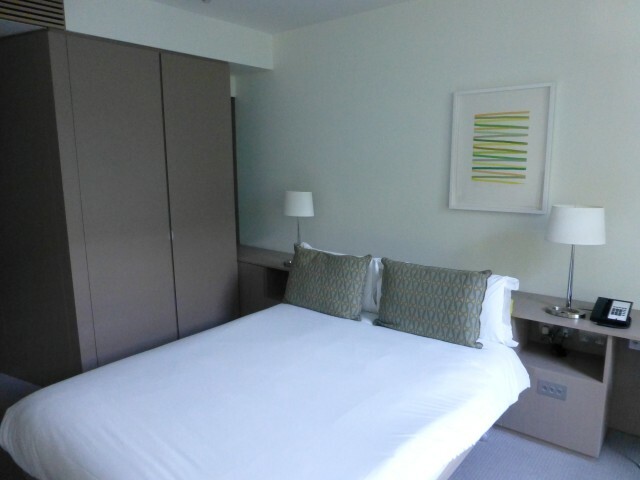 There were no king rooms available (which isn’t unheard of in Europe), so we were given a great queen room. 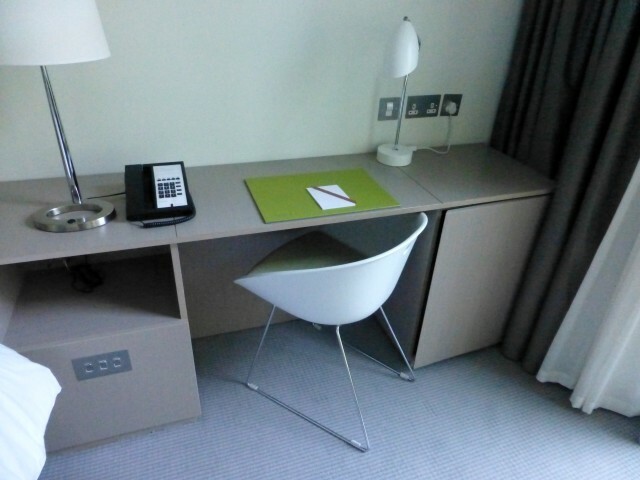 The room also had a small desk in the corner, two very comfortable club chairs and a floating shelf with a TV. 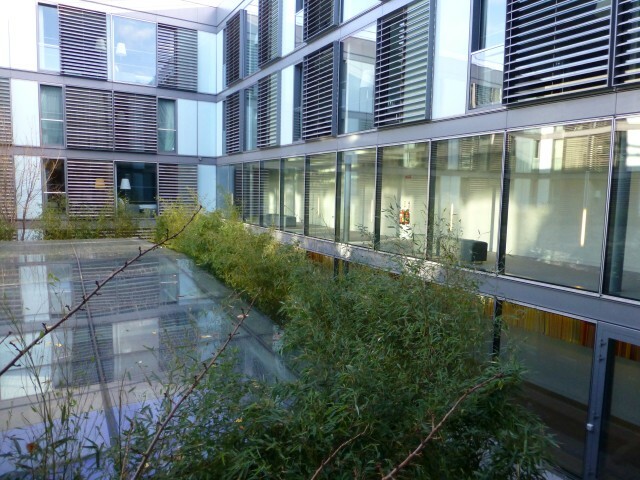 There was a patio door that opened onto the courtyard, but the patio wasn’t large enough to actually stand outside. 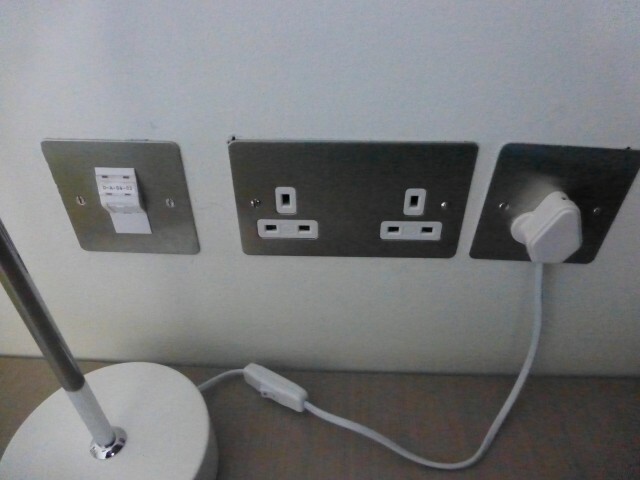 This hotel gets it. 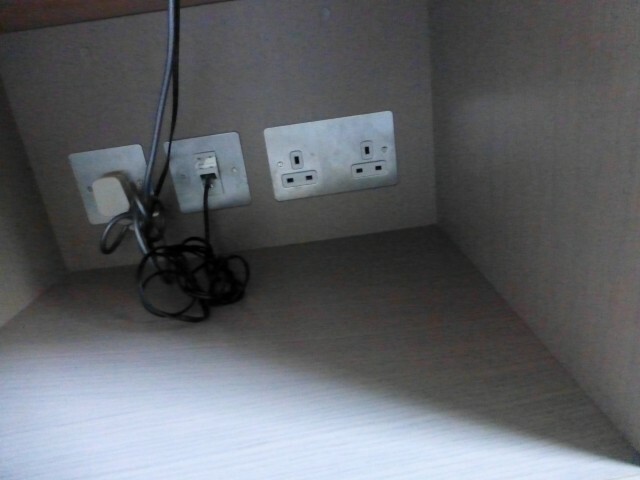 There were two outlets on the desk, two outlets under the desk in the nightstand cubby on each side of the bed and two outlets on the floating shelf near the TV. 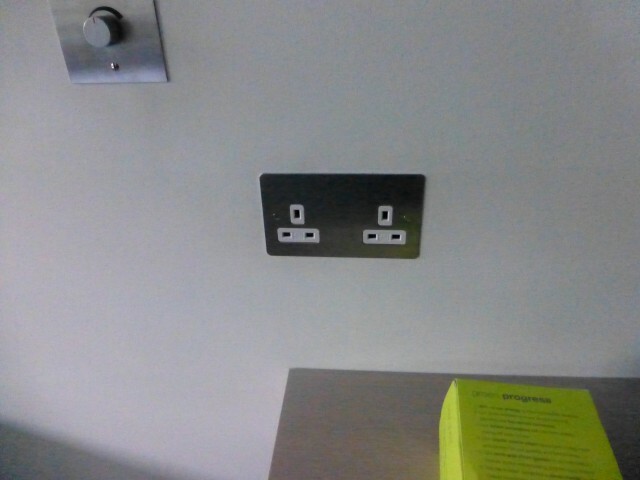 I wish every hotel added extra outlets like the Gibson does. Kudos Gibson, Kudos. 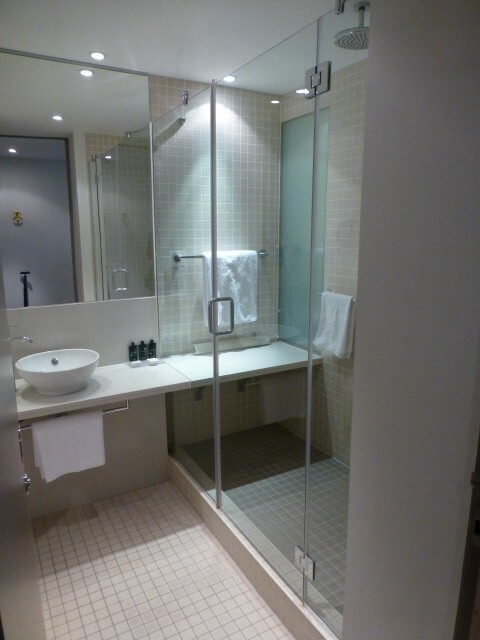 Like the rest of the hotel, the bathroom was sleek and modern. It also had a speaker that piped the sound from the TV into the bathroom. 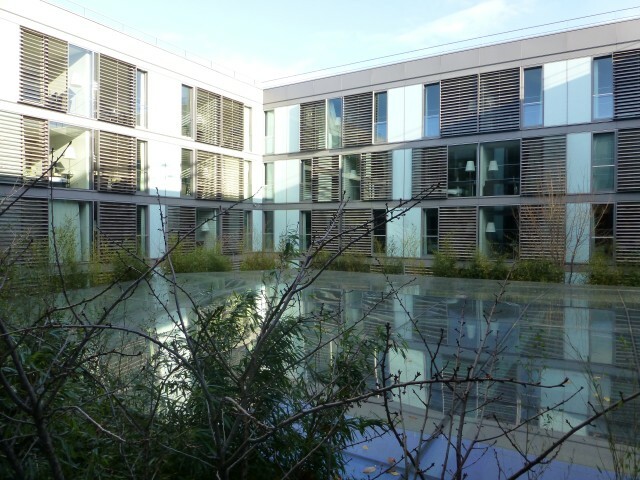 I first noticed this at the Pullman Toulouse Center in France. Unfortunately, we couldn’t figure out how to adjust the volume level at the Gibson. 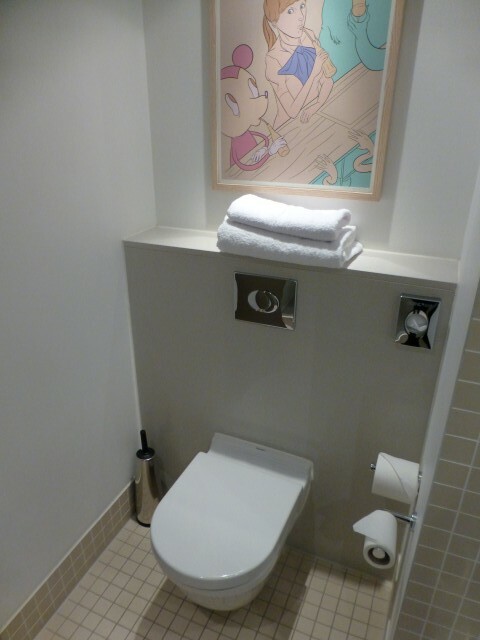 I haven’t come across this “amenity” in the US before, but it seems relatively common in new hotels in Europe. Have you come across this before? The water pressure was great and the temperature was consistently hot. How great. One wall was all windows and brought in a great amount of sunlight and looked out on the internal courtyard of the hotel and the Conference Center. We stayed at the Gibson Hotel for two nights (Friday and Saturday), ate the included breakfast each morning and slept pretty well the entire stay. The area isn’t the most ideal for exploring Dublin, but there is a tram stop immediately outside of the hotel which made it pretty easy to make it to a part of town with more life. Would I stay in this hotel again? Absolutely. I wouldn’t think twice about it. The rate was reasonable, the staff was friendly and efficient and the rooms were clean. I would highly recommend this hotel for all tourists in Dublin. Here you will not find an old/historic property that played a key role in Ulysses, but it will be a great staging ground to see historic Dublin. Have you stayed at the Gibson Hotel before? When in an old City like Dublin do you prefer to stay in a modern hotel with fantastic amenities or an old world traditional hotel? By Tim in Travel on December 13, 2012 .